I used China Glaze 2030 from Khrome Collection as a base for the Saints nails, Zoya Raven for the fleur de lis outlined in Sally Hansen All the White Stuff. 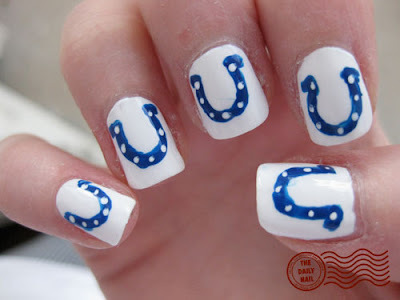 For the Colts nails, I used Sally Hansen All the White Stuff as a base, with Pure Ice French Kiss for the horseshoe and Sally Hansen All the White Stuff again for the white dots. Topped off both teams with 2 coats of Seche Vite top coat. 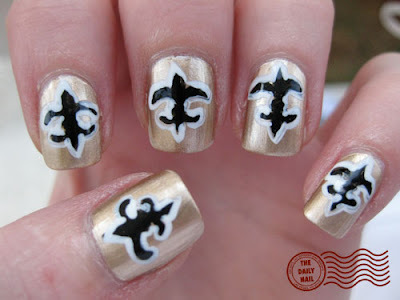 Ok, enjoy the Superbowl, I'm off to get some wings to mess up my pretty nails. *drool* They're all I can think about today. P.S. I think you should do snowflakes on your nails next time for all us east coasters that just got buried under the blizzard! It was an interesting game. I love it when it's not one sided. New Orleans really needed this. They've had a rough time of it. Good for them. Yay! We'll be cheering for you another year, Indiana! I did football nails too, I just didn't do a team theme since I had no care who won. But it's fun to see the theme!